This week's Moms in Review is soooo exciting! Word just broke on PerezHilton.com that Demi Lovato is joining Britney Spears as a judge on X Factor. That's cute, Simon. And very smart. Recruit all the Mouse Ears you can and you're guaranteed (at least for me) to watch this season's X Factor! I personally cannot wait to enjoy every second of my Brit Brit lighting up the TV. I just had to show you this cute pic I found from the internets. This is a makeup blog after all, y'all! Now with the cool $50 million Brit's reportedly getting paid to judge, she can finally hire me to do her makeup instead of her boys, lol. Beyonce, People Mag's 2012 Most Beautiful Person, shows off her post baby bod in St. Bart's in April. New moms everywhere can finally relax knowing that it took her 4 mos. at 5 days a week working out to lose that 40 lbs she put on. So, Mommies if it takes you a little longer, don't be so hard on yourselves. In this economy I'd rather my kid have shoes to wear than me have a trainer, too. However, if it's one thing we can agree on Snooks is this: WHO takes their kid tanning with them? 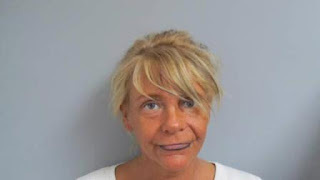 Yup, Patricia Krentcil is not only guilty of child endangerment, but also of wearing a strange color of skin. And, in this mugshot apparently black lipliner just on the lower lip. Hmmm. Makes me wonder. Her skin changes color in almost every media I've seen her in this far. You let me know if I'm crazy or if you agree with me, would ya'? !